ParaPicker® PP03 are super-dynamic parallel kinematic robots with linear drive technology. 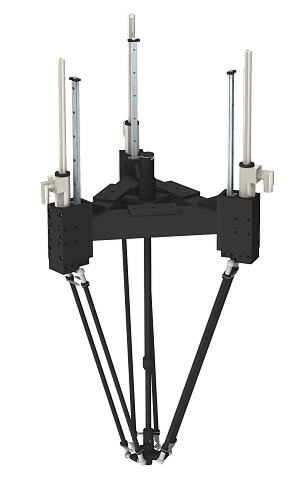 In 2005 we first introduced a two-axis parallel kinematic robot, that used linear motors as actuators. This was the begining of our ParaPicker® technology! 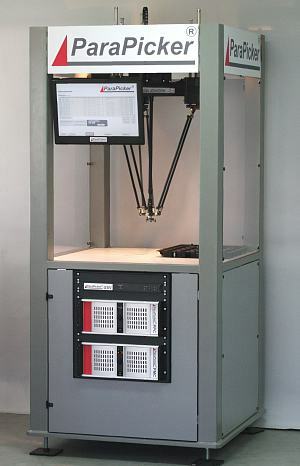 Based on the established HighDynamic® linear motor modules, the 4-axis ParaPicker® industrial robot PP03 was developed and was first introduced in 2010 at the MOTEK fair in Stuttgart. See the presentation on the right. in 2011 ParaPicker® participated in the robotics award at the Hannover fair and was under the top ten applicants! For our Parapicker® Pick & Placer, we use controllers out of the LinMot® range. Who supplies ParaPicker® Robots PP03? ParaPicker® robots are manufactured and marketed in cooperation. > Data sheets coming soon!